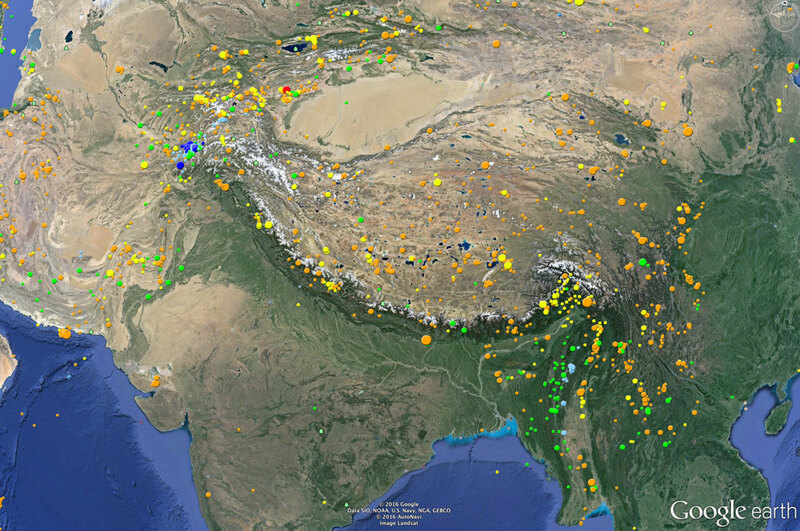 Earthquakes from the ISC-GEM Catalogue in Central and South America (top) and Central Asia (bottom). The ISC-GEM Global Instrumental Earthquake Catalogue (1904-2015) is the result of a special effort to adapt and substantially extend and improve currently existing bulletin data for large earthquakes (magnitude 5.5 and above, plus continental events down to magnitude 5.0) to serve the requirements of the specific user group who assess and model seismic hazard and risk. The catalogue also has a multidisciplinary use in a wide range of other areas such as studies of global seismicity, tectonics, inner structure of the Earth, nuclear test monitoring research, rapid determination of hazard etc. 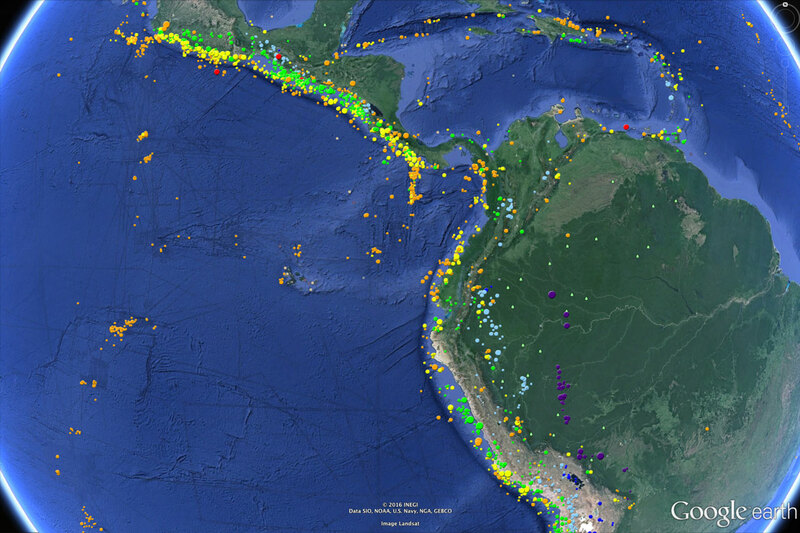 This global catalogue was also designed to serve as a reference to be used for calibration purposes by those compiling regional seismicity catalogues that contain events of much smaller magnitudes. This way the catalogues prepared by other teams for different regions will contain comparable earthquake locations and magnitude parameters, especially in border regions. The ISC-GEM catalogue was initially co-funded by the GEM Foundation as part of its five Global Hazard Components. The catalogue Version 1 was a result of the 27 month long project ended in January 2013 (Storchak et al. 2013). This project was led and co-funded by the ISC and performed by a Team of International Experts in accordance with the requirements of the Scientific Board of GEM and following recommendations of the team of IASPEI Observers. During the period from November 2013 till December 2017, with the sponsorship from several public and commercial bodies, we worked on the Extension Project to include earthquakes (above 5.5) that occurred after 2009 and smaller earthquakes (between 5.5 and 6.3) during 1904-1959. In January 2018, we began working on the next 4-year Advancement Project that aims to bring additional source parameters of early earthquakes from scientific literature, add smaller earthquakes with Mw 5.0-5.5 in continental areas during the modern instrumental period (1964 - present) and improve magnitude determinations by identifying and addressing some reporting gaps of quality long-term seismic stations.